Solid leadership for a better, safer industry. The Alabama Trucking Association Board of Directors has elected Fenn Church, President of the Birmingham-based Church Transportation & Logistics, Inc., to serve as its Chairman for fiscal year 2018-’19. His term began July 1, 2018 and runs to June 30, 2019. A native of Dothan, Ala., Church, 52, grew up around transportation and logistics, working part time for his family’s paper products distribution business. He later worked summers for Coffman International Trucks, a commercial truck and heavy equipment dealership based in Dothan, before heading off to Auburn University where he earned a B.S. in Transportation and Physical Distribution followed by an MBA from the University of Tennessee in Transportation and Finance. Church has worked in fleet management for more than 30 years, gaining sales and managerial experience at both large and medium size carriers before founding his own business in 2000 with a single truck and driver. Working through one of the worst economic downturns in American history, Church steadily grew the company to now include nearly 70 trucks and as many trailers. 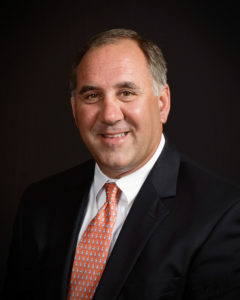 According to ATA President and CEO Frank Filgo, Church brings a wealth of experience and knowledge to the Association, and his presence will be felt immediately in furthering the Association’s mission of protecting and promoting the state’s trucking industry. Church said the industry’s most pressing concern is the lack of adequate highway funding, and he pledged to work with Association leaders to devise appropriate, substantive means for funding the state’s crumbling infrastructure. The last time Alabama increased its fuel tax issue was 1992.